You are courageous: Some of you stepped out of your comfort zone to give a You Matter card to a stranger, while others summoned the courage to give a You Matter card to a family member you struggle with or take for granted. You are generous and kind: You have attached your cards to food baskets, cash, thank you notes, windshields, books, and even bills! You are seeing others with fresh eyes: You are no longer taking for granted a service provider, client, student, veteran, spouse, or friend. You live in wonder: You looked for and created opportunities to share You Matter magic and then paused to notice and accept the impact on others and on yourself. You are connectors: You have connected with those with whom you shared your cards in deep and lasting ways, you have connected to our YMMcommunity by sharing your stories and encouraging other YuMMies, and you have connected to parts of yourself hungry for expression. And you are glorious change agents making and mending the world one card at a time. 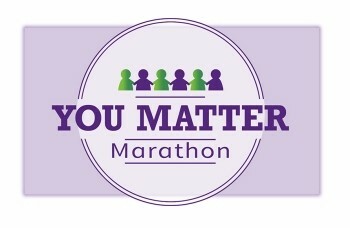 You have confirmed that while the You Matter Marathon is ending, the You Matter Movement is just beginning. Please click here to take this 3-minute survey about your YMM experience. Listen to an audio recording of the You Matter Marathon Community Celebration. Visit the YMM webpage for links to print or order YM cards. The links will be available until 1/1/17. The YMM Facebook page which will stay as active as you wish it to be. I will still post there from time to time. As for my next steps, the You Matter Marathon has been a year in the making and I am both exhausted and exhilarated from the effort. I will take December to savor the experience and consider what’s next, including the possibility of finding a sponsor and making the YMM an annual event, creating an e-book or TED Talk to get even more folks engaged in the magic. An abundance of gratitude goes out to a few generous organizations and bloggers who helped spread the word online: BizCatalyst 360, Daily Good, The Institute for Research on Unlimited Love, the Positive Psychology Program, the Random Acts of Kindness Foundation. A complete list of YMM media can be found here. None of this would have happened were it not for: Nedra Fetterman giving me a You Matter card, and Nedra receiving her You Matter card from Vicki O’Grady, my colleagues in my Positive Psychology program (Tina, Melissa, Louis, Erin,) urging me to follow my heart and not my head for my final project, my father’s overwhelming support for me giving the You Matter cards for free, and my husband’s unwavering interest and encouragement, not to mention his patience while I turned our dining room into a fulfillment (perfect word!) center. You Matter and I am forever grateful.